I know you want to make an impact on the lives of your clients. And in order to work with them, your site visitors & readers need to 'click' or 'call' — on a practical level, you need to communicate with them so they can do just that! But creating marketing materials or a website without any thought or preplanning is inefficient and ineffective! 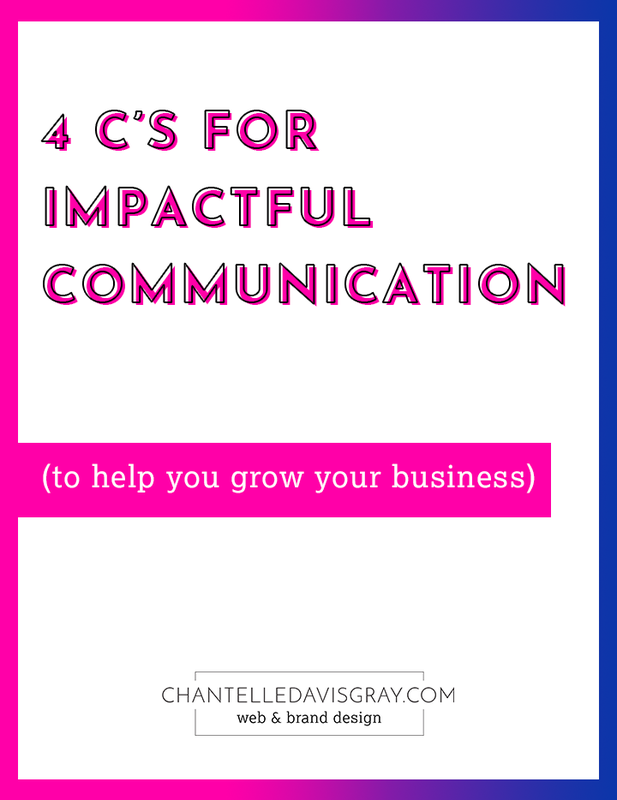 A few moments of pause for the 4 C's (as I like to call them) will help you create compelling communication that supports your business. Before you even start to design, you need to decide howpeople will literally connect (or interact) with it — will it be printed or digital? This is more like 1B... think about how you'd like your content to connect emotionally. How do you want your viewer/reader to feel!? Should they be laughing, feel inspired, or choked up? What's the best way to invoke those feelings — a funny meme, an attention-grabbing headline, a personal story? Now start writing — put pen to paper or fingers to keys! Tell your story. Share your heart. And have great images at your fingertips, keeping in mind that you can't simply pull images from Google or Pinterest. You need to use authorized stock photos or your own. *There are two ways to get started – option A would be to first decide on the vessel, then create the content to fit. Option B is to start with content and pick a vessel that will accommodate the content. I almost always choose option A, however, sometimes I'll write the content first (like this email) for it's primary purpose, and then modify to retro-fit a different vessel (like Facebook). What's the end goal of this communication? You’re rarely sharing just for the sake of it — you want them to take action, right? What do you want them to do after they read/watch it? It might be to visit your website to learn more, click “like”, comment, schedule an appointment or call you. Your brand should have a consistent look & feel across all platforms & mediums! If you have a logo that’s bright red & clean lines, you want to bring those elements into everything else. When someone sees your poster at their yoga studio, after they've seen your FB ad, you want them to recognize something about it, so it feels familar, which makes them feel like they "know" you. Whether it's with your overall fonts & colors, or posting in your Facebook group, consistency shows that you’re reliable. A signal goes off in the subconscious that you can follow through & stick with something. All of this contributes to the know/like/trust factor which we know is vital! !